Polk State College is committed to providing students, faculty, staff, and visitors with a safe and secure environment. 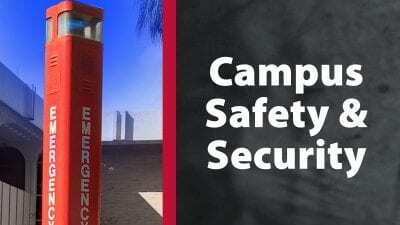 Security is provided 24 hours a day, 365 days a year on both the Winter Haven and Lakeland campuses. In the event of an emergency, you can reach Security by pushing the call button on one of the emergency towers or by calling the Security Communications Center. Lost-and-found is located in the Security offices on both the Winter Haven and Lakeland campuses. Polk State College security officers have the authority to ask persons for identification and to determine whether the individuals have lawful business at the College. Security officers have the authority to issue parking violations to students, faculty, and staff. Security officers do not have law enforcement authority or possess arrest powers. Criminal incidents are referred to local law enforcement agencies that have jurisdiction on the campus. The College Security Department maintains a good working relationship with the Winter Haven Police Department, Polk County Sheriff’s Department, Lakeland Police Department, and Lake Wales Police Department. Security officers often collaborate with police officers when crimes or other incidents requiring a police response are reported. Crimes, incidents, safety concerns, and other emergencies on campus can be reported directly to the Campus Security Office by dialing extension 5059 from any Polk State campus telephone. Additionally, there are several blue-phone emergency call boxes strategically located throughout campus. In the event of an emergency, a blue-phone can be used to directly contact Campus Security. By pressing the call button, the blue-phone automatically connects the caller to Campus Security and also indicates the location of the call. The call immediately connects to the security guard on duty, who will then provide the appropriate service needed for the situation. To reach the Campus Security Office via a public phone, cell phone, or off-campus telephone, individuals should dial 863.297.1059. Students, faculty and staff are encouraged to report all suspicious activities and persons observed on campus. Such calls should be made promptly to improve the ability of the Campus Security Office to investigate the situation, apprehend suspects, and prevent potential crimes. Upon receipt of a call, security officers respond immediately to the site of the emergency. All incidents are investigated and the officer files a report. Please note that Polk State College does not have procedures for voluntary, confidential reporting of crimes. Because college reports are public records, the college cannot hold reports of crimes in confidence. Violations of the law will be referred to the appropriate local law enforcement agency, to the dean of student services and to the campus provost on the Winter Haven or Lakeland campus. A daily crime log is available for review during normal business hours at the Security Office in the LMB building on the Lakeland campus and in the WMS building on the Winter Haven campus. Information about crimes typically include the case number, classification, date reported, date occurred, time occurred, general location, and disposition of each crime. Florida Law requires persons designated as sexual offenders or predators to register with the Sheriff’s Office if they are enrolled, employed, or carrying on a vocation at an institution of higher education in this state. The offender must report the following information: name, address, and county of each institution, including each campus attended, and the sexual offender’s enrollment or employment status. Each change in enrollment or employment status shall be reported in person at the Sheriff’s Office, within 48 hours after any change in status. Information about registered sexual offenders and predators may be obtained through the Polk County Sheriff’s Office, or by calling the FDLE hotline (1.888.357.7332) or visiting the FDLE website at offender.fdle.state.fl.us. Polk State College is a drug-free work place and a drug-free academic institution. College employees and students are prohibited from the unlawful possession, use, sale, or distribution of illicit drugs and alcohol on college property or as part of college activities. Florida Statute 790.115, prohibits individuals from possessing firearms or other dangerous weapons on Polk State property or at a school sponsored event, except as authorized by Florida law. Pursuant to Florida State Statute 790.06 (12a), a concealed weapons license does not authorize any person to openly carry a handgun or carry a concealed weapon or firearm on Polk State property or at a school sponsored event. If a person is the victim of a sexual assault at Polk State, the first priority is to go to a place of safety, call 911 or the appropriate law enforcement agency based on the location of the assault, and then call Polk State College Security. Polk State’s security officers will assist the victim in notifying the local law enforcement agency. Time is a critical factor for evidence collection and preservation. See this page for further information about preventing sexual violence. Polk State College has a formal Discipline and Due Process Policy that is coordinated through the dean of student services. This policy is available via the Polk State College website and DBOT Rule 4.01.